Until now I only wrote Mezuzot and Megillos, but I will ii"H soon start writing a Sefer Torah for personal use. I thought the fellow members could help me with some practical considerations. 1) I need the best tikun. From what I gather, R' Chernobyl from BB has the best one - is this true? The shops in Mea Shearim I went to were not really interested in supplying any kind of tikkun for sefer torah. 2) Over the years I've come across the halachic discussions in regards to the different mesoras of spellings (e.g. pezuei daka) and spacing (e,g, shirat hayam) in theory. Today do we all use exactly the same spellings and spacings in stam? Is this tikkun's spellings approved by all gedolim? 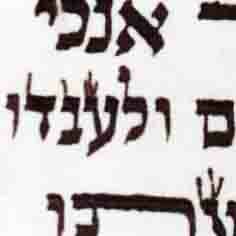 3) Does this tikkun shows when the letters should be done it differently (e.g. Vav Ketia) or I have to realize it myself? 4) Can I start sowing the yerios together as I write or must I necessarily sow all together only in the end? 5) I once heard ideally there's an inyan to write the Torah kesidran as much as possible. Does anyone try to do that? Kind of a "problem" for me because I'm missing the Bereishis yeria still. Since is for personal use I don't mind at all waiting for the this yeria to arrive if there is such a inyan. 6) Besides the obvious "leshem kedushas etc..", is there anything else to say before starting (I remember vaguely in my mind that there's a perek tehillim that could be said)? 7) Is it wise to ask a magia to check each yeria as I write them, to minimize possible losses or there's no point? Any other insights are greatly appreciated. Writing my own Sefer Torah was the reason I got into Safrus many years back and after a lot of waiting, I now have the possibility to do it, so I really want to start with the right foot and take advantage of the collective experience you all have. Rav Ya’akov Chenagel of Benei Brak has several tikunim with different layouts (245 column, 248 column, etc.). He can also provide a tikun in any of the known masora variations. He is very knowledgeable of the opinions of the poskim (both classic & modern) and can recommend a nusach based on your requirements. Rav Chenagel can prepare a custom tikun, sized to match the width of the column you are writing, with the lines of text spaced so that you can fold down each line of the tikun as you write. That way, the top line of the tikun is always the current one. See an example here: http://www.flickr.com/photos/stamink/9551434715/. Ask for "kipulim" if you are interested. To my knowledge Rav Chenagel does not have email, but I have found him very accessible by phone: 03-570-6803 (from Chu"L: +972-3-570-6803). It's been a long time since I looked into using "shkufi'ot", but most of the Sofrim I know who write on a light-table use a tikun by R. Yechiel Nachmani: 050-875-2138. Both tikunim (Chenagel & Nachmani) will indicate "special" letters and other considerations (words that must be on the same line, etc.). It's better to wait until the end to sew together the yeri'os — otherwise the Sefer will get too unwieldily. It would be best to pay a professional to sew the Sefer when it's done. A pro can do a perfect job in a fraction of the time it will take you or me to do an OK job. I'm not sure there's a point in checking each yeri'ah as you go — it will significantly slow things down. I would recommend giving in 5-10 yeri'os at a time. I would also recommend getting a computer check first, correcting any mistakes the computer found, then giving it in for a manual haga'ah (or 2). 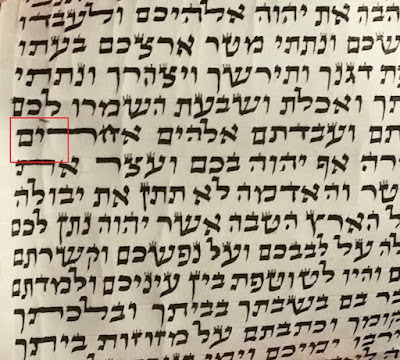 When I write a Sefer Torah, after doing all the corrections (the initial computer check and 2 magihim), I then give it in for an *additional* computer check. The second computer check almost always finds something. With regard to safek Shemos, most tikunim follow the list in the Keset Hasofer. I personally use the expanded list in the back of the sefer "Nekadesh Es Shimcha", which is based on the p'sakim of Rav Elyashiv (I had to go through the whole tikun and manually mark the various words). feel free to reply with any additional questions. I spoke to him earlier today. He says there's a new 48 lines Tikkun, which is more mehudar. Virtually everyone uses his 42 lines tikkun, so now I'm confused. The 4 initial yerios i bought are 45cm and 42 lines, but of course I would prefer to choose the best, but for that I need to make a special order of new klaf. Does anyone knows this new 48 lines tikkun? Btw, this new one is much more expensive because is a whole new arrangement. I think I had the wrong name in my head, it must be Rav Chenagel then. It seems everyone goes to the same person, I find that really puzzling. From what I understood, it's his own tikkun, a result of his own research. I'm happy to hear he has different possibilities, but I will have difficulty choosing one. I will discuss with him. Maybe he can also print the tikkun with the extended list you noted. I just finished writing a sefer Torah in June and along the way I learned a few things that might be helpful. If I had to do it again, I would have bought all the klaf at once. In the course of the year and a half it took me to write the Torah, the price of klaf went up constantly. By the end I was paying about thirty percent more per yeriah than I was at the beginning. Which meant that I spent about a thousand dollars more than I would have if I had just ordered a complete set at the get go. 2. Be picky with the klaf you write on. If you have the chance to be in Eretz Yisrael pick each yeriah out yourself. 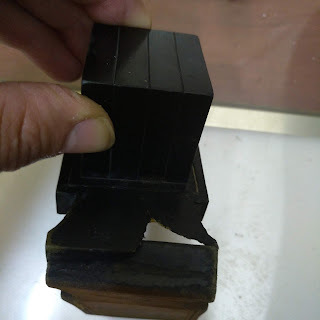 Most of the klaf I was shipped was top quality, but there were several pieces that either were just brutally difficult to write on or were too weak around the edges to be used in a Torah scroll. Writing a Torah scroll when you're in the midst of it can seem like you're wandering for forty years in the wilderness with no end in sight. It's grueling, painful, sometimes down right discouraging work, but it can also be a beautiful experience. I found it helpful to constantly remind myself of my original purpose in writing. Not to put you off at all, because there's nothing in the world like completing a sefer Torah and seeing and hearing it read from week after week in shul. Lastly, because it sounds like you are doing this just for the mitzvah rather than as a commission, I would say that writing Torah is a mitzvah too big to keep all to yourself I'd strongly encourage you to get as many other people involved as possible whatever you intend to do with the Torah when it's finished. R' Etan is right you will definitely get a better finished product if you give the sewing of the yerios to a professional. But, I know I made a friend for life when I invited our local Chabad Shliach, a young guy in his first year of shlichus, over to help me sew the new Torah together. He was so moved it actually brought him to tears. In the end our stitches could have been straighter, the creases a little flatter, but I realized that letting others in close to the making of a Torah, especially in an area where Torah and mitzvos are rare, can have a profound and lasting effect on them. So, I'll take the little imperfections that come from making the sewing of the Torah scroll a community event. Just my two cents. Mazel tov on beginning your first Torah! In regards to Klaf, I have a very good source - my tutor is a very famous klafim macher and I can get his best yerios. That was also my #1 worry, since I once had a bad yeria in my 11-lines megilla and it was really painful. My main concern now is with choosing the right tikkun. I was advised to get the unusual 48 lines tikkun but that would require a special order for klafim and I'm afraid that making a special order will force me to accept some less good klafim. So I'm thinking I should stick with the standard klaf so I can be picky and get the best. Although all the actual Mitzva side I will do myself, I have no problem inviting others to help in other aspects like sowing. In fact, in the very end we always invite others for the last letters, so what you said makes sense. YK, can you share with us your Tutors Contact Info? for Klaf purpose.